1. Prepare service tee by removing protective wrapping from the cap to below the branch. NOTE: Be sure the service tee type is the type that utilizes the brass completion plug and that the threaded cap can be removed without any release of natural gas. 2. Remove protective cap to gain access to the brass plug. Check that the completion plug removal tool fits the completion plug (Fig. 1). 1. Select the proper size threaded adapter for the service tee to be stopped or removed. 2. Loosen the completion plug with a properly sized open end wrench - Do not loosen too much as the plug could become disengaged from threads. The completion plug removal tool is not designed to break the plug loose. 3. Screw the threaded adapter onto service tee and tighten with bar wrench supplied (Fig. 2). Operator may select to mount the threaded adapter with or without the ball valve. 4. Thread ball valve onto service tee threaded adapter if not already completed (Fig. 3). Hand tight is sufficient. Valve can be left in the open position. CAUTION: If at any point during these procedures there is any apparent release of gas or other product stop the procedure immediately, and take corrective action. 1. Thread completion plug removal tool onto ball valve (Fig. 4). Hand tight is sufficient. Apply a light film of grease to tool shaft to assist in shaft movement. 2.. Close 1/8" bleeder valve on upper side of ball valve. 3. Lower completion plug removal tool and engage completion plug. Be sure the tool engages the completion plug properly and the retainer stem of the tool drops sufficiently to retain the plug (approximately ½"). 4. Try to tighten the plug slightly to confirm proper tool engagement with the completion plug. 5. Push down on the tool continually while turning the tool counter clockwise to unscrew the plug from the service tee. Do not allow the hydraulic force to push the tool upward while unthreading the completion plug. A slight ratchet effect will be felt and heard once the completion plug has disengaged from the threads inside the service tee. Slowly raise the plug removal tool until completely up and out of the valve. 6. Close ball valve and open 1/8" bleeder valve (Fig. 5). 7. Remove completion plug removal tool from valve, complete with completion plug. NOTE: Once cap has been removed, DO NOT leave tool unattended. Place the lock-out plug on to tool if unattended. Follow company lock-out procedures. 1. Install the plug setting tool extension drive onto the expandable plug tool shaft (Fig. 6). Extension drive locating pin should be on the right side notch when looking down the shaft for installing the expandable plug. Secure the extension drive in place by tightening the set screw. 2. Place the expandable plug onto the expandable plug tool shaft extension in the tighten position. (Right side while looking down tool shaft.) Be sure the expandable plug is completely relaxed to ensure a loose fit inside of service tee. 3. Mount tool housing extension onto the top of the ball valve (Fig. 7). 4. Before mounting expandable plug setting tool into tool housing extension, place tool along side of valve to get a distance measurement from the bottom of the expandable plug to the top of the expandable plug tool housing. This will ensure the expandable plug is located just above the main line and far enough below the service tee branch. 5. 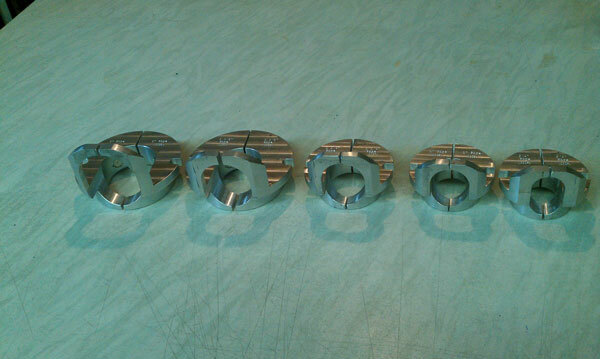 Thread expandable plug setting tool onto the top of the tool housing extension (Fig. 8). Hand-tighten is sufficient. Do not use wrenches. NOTE: Apply a light film of white grease to the tool shaft to assist in shaft movement. 6. Close 1/8" bleeder valve and open ball valve. 8. Slowly lower expandable plug down into service tee until the plug contacts the main or the pre-measured depth in step 4 of the 'Inserting the Expandable Plug' Section. 6. Turn the expandable plug tool handle clockwise while holding the tool shaft until tight. 7. Open service line riser valve and vent service line to a safe location. 8. Once service line has been vented to a safe location, press expandable plug tool shaft downward slightly while turning tool shaft clockwise approximately ¼" to disengage from the expandable plug. 9. Raise expandable plug setting tool shaft upward and open 1/8" bleeder valve on ball valve to confirm all pressure has been released from tool. 11. Remove Safe-T-Stopper® tool if service tee is to be removed. 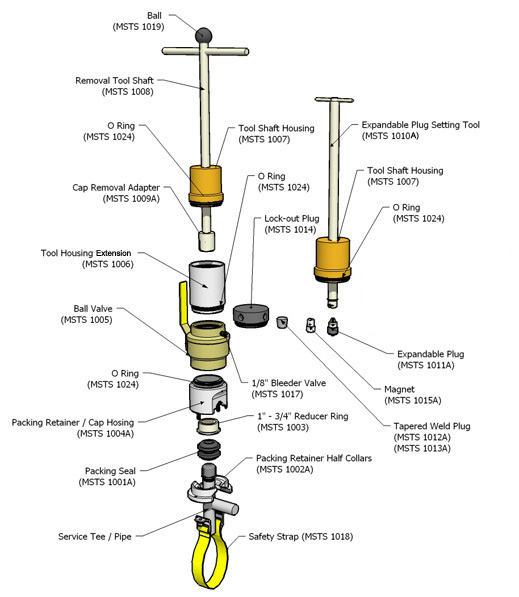 Do not remove Safe-T-Stopper® tool if service tee is to be put back into service. NOTE: - If expandable plug were ever to become disengaged from tool, attach magnetic retrieval tool to the plug setting tool to retrieve disengaged plug. (Fig. 9). 1. With Safe-T-Stopper® tool removed from service tee, measure the distance from the top of the tee to the top of the expander plug. 2. Mark service tee cut off location. Be sure to cut service tee off above the tension nut on the expander plug. Do not use high heat devices to cut off tee. This could cause excessive heat for the expandable plug to remain in place. Use hand cutter or other tools approved by the company standards to cut off service tee, ensuring that excessive heat is not created. 3. Place properly sized tapered plug closing device into service tee stub above the expandable plug (Fig. 10). 4. Once correct tapered plug closing device is set in place, tap the plug into place with a hammer and back-weld entire circumference onto service tee stub.